A grocery store, apartments, affordable housing and about 100 jobs are coming in, and a stretch of highly trafficked roadway and two medians are coming out in Northeast Denver as part of a new development project. DENVER — A grocery store, apartments, affordable housing and about 100 jobs are coming in, and a stretch of highly trafficked roadway and two medians are coming out in Northeast Denver as part of a new development project. The proposed project is the brainchild of EXDO Properties, located between 36th/37th and Downing/Marion streets. That’s the convergence point of rapidly developing RiNo and the historic Cole neighborhood. “And nobody in RiNo or Cole has walkable, bikeable, easy access to fresh and affordable groceries,” Andy Feinstein, EXDO Property Group’s managing partner, told Denver7. “(That's) fresh vegetables, fresh meat, affordable options for everyone in the community,” Feinstein said. He added that the store will be a recognizable brand name, but that hasn’t been formally announced yet. The project will also include more than 200 apartments, 20 of which will be affordable housing for those in the 60 percent Average Median Income range (or an individual making around $37,000 per year). The most unique aspect of the plan is the fact that it involves a removal of a stretch of roadway that will become part of the plot that’s built on. Lawrence Street between 36th and 37th, as well as at least one of two medians will be removed. “We were able to acquire this road and this median and that way we can consolidate this entire block and make this project happen,” Feinstein said. 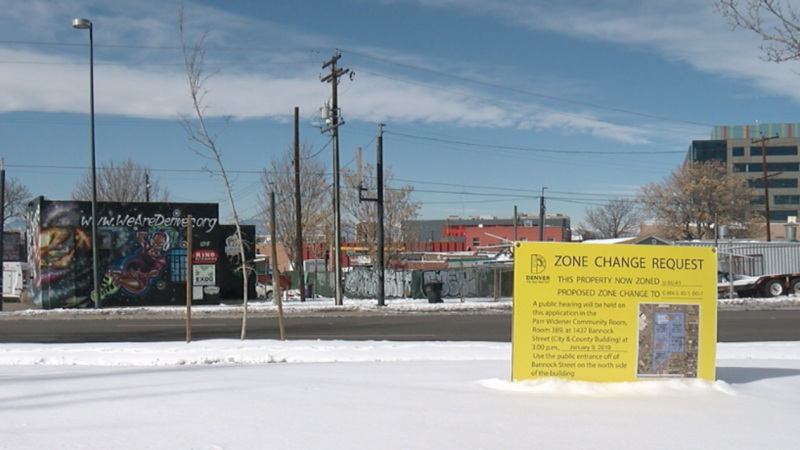 The Cole Neighborhood Association tells Denver7 that the majority of residents are “very excited” about the grocery store coming. Some residents did express some concern over the loss of green space and trees within the triangular medians. Design plans are still in the works, and depend on if the project gets zoning approved by the Denver City Council. The developer says the goal is a shovel in the ground in 2020 and shopping by the end of 2021.